Alice will share some results of the student questionnaire and interview based study she and Francine May launched last year. 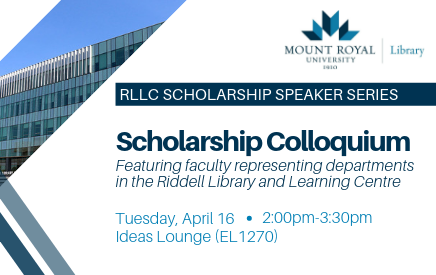 Pearl and Madelaine will discuss their findings after evaluating library usage statistics and surveying MRU Education students about their use of the Library's Curriculum Collection before and after the move to the RLLC. They will also connect their data to trends related to academic branch libraries, new library spaces and the idea of an embedded collection within a faculty or department. Sara will share some thoughts on the concept of information value, arising from her interviews with staff at a community health centre in Calgary. She will share how this exploration of value as one dimension of information literacy in a workplace context provides an opportunity to discuss the relevance of the ACRL Framework concepts in professional practice settings and consider implications for information literacy instruction. Operating under the Library Faculty Council, the Scholarship Standing Subcommittee initiates opportunities for academics from all departments in the Riddell Library and Learning Centre to present research in progress or project results in an inclusive and supportive venue where ideas are workshoped and feedback is applied to draft papers or upcoming conference presentations.